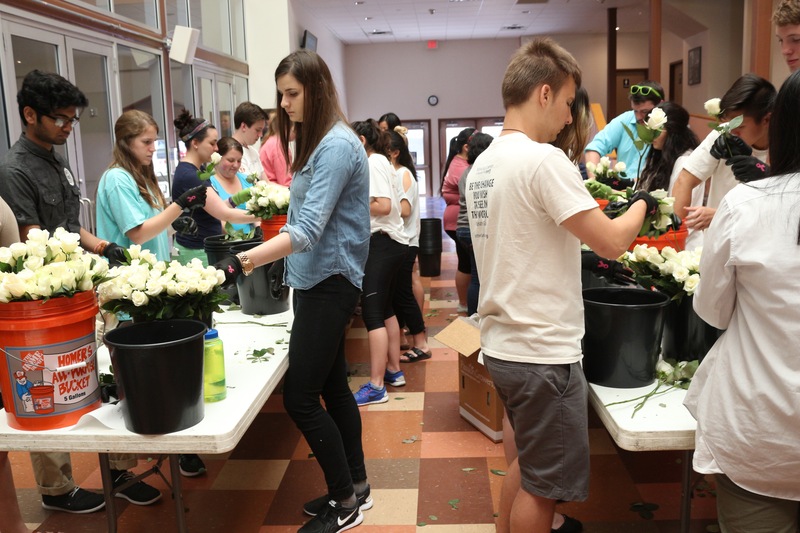 Earlier this month students carried white roses around campus as a means of promoting awareness of genocide and commemorating the victims of the Holocaust. 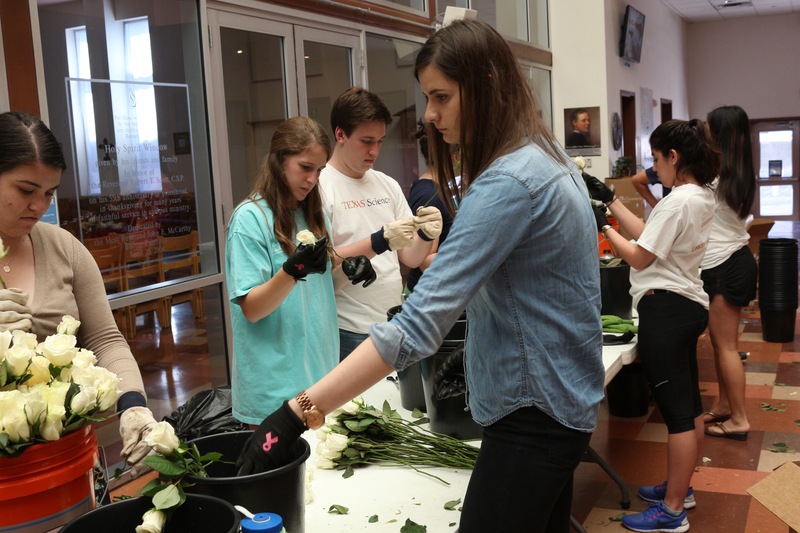 This event was put on by the UT chapter of The White Rose Society, and led by co-presidents Leah Kashar and Sophie Jerwick. The White Rose was a non-violent, intellectual resistance group in Nazi Germany consisting of students from the University of Munich and their philosophy professor. The group became known for an anonymous leaflet and graffiti campaign, lasting from June 1942 until February 1943 that called for active opposition to Adolf Hitler’s regime. The original Society was executed by Gestapo, the secret state police of Nazi Germany. 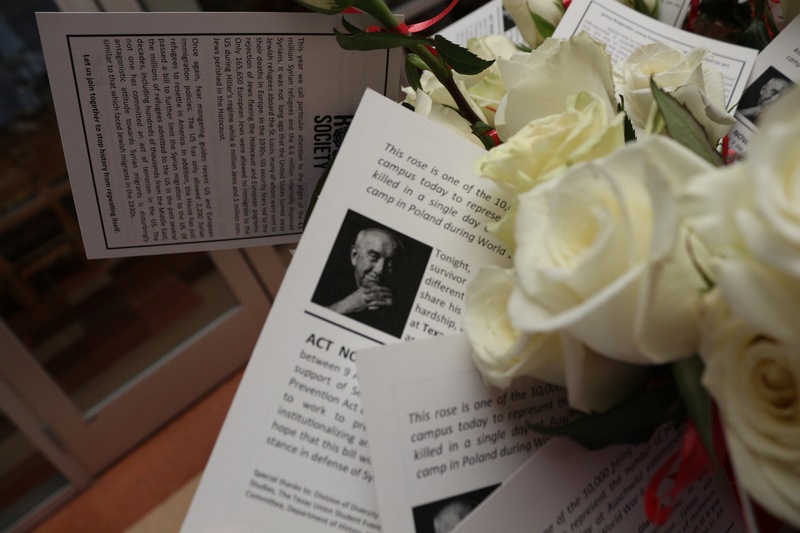 The White Rose Society addresses growing concerns of “fascism and right-wing hate” spreading across Europe and North America. Currently, the group is calling particular attention to the human rights crisis in Syria and to the plight of over 11 million Syrian refugees. Today the UT branch also focuses on Holocaust remembrance and genocide prevention. 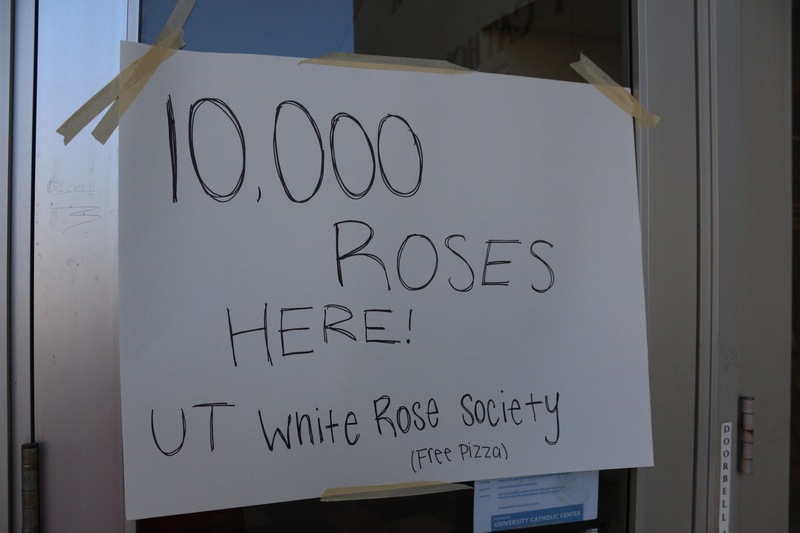 On April 5, the UT White Rose Society asked volunteers to help the group cut and de-thorn 10,000 white roses to distribute around campus the following day. 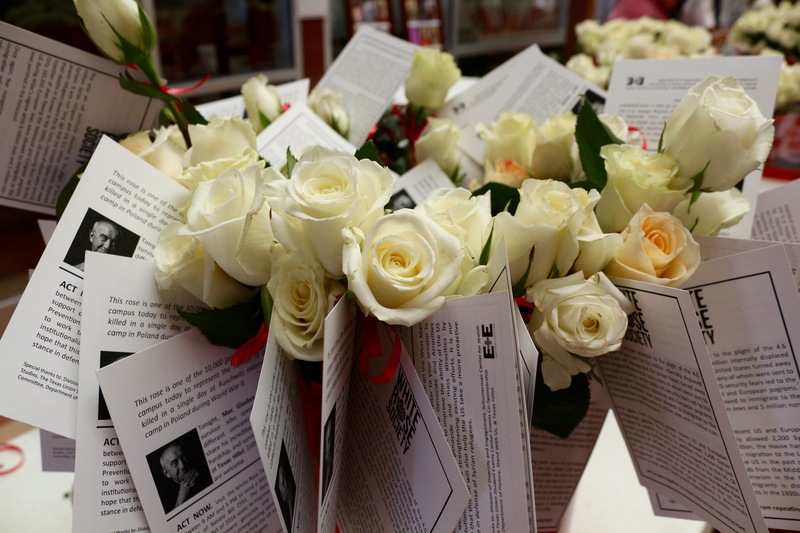 The roses served as a commemoration of the 10,000 individuals who died every day in Auschwitz during the Holocaust. Max Glauben addressing the audience during his talk. Sign showing volunteers where to go to de-thorn the roses. 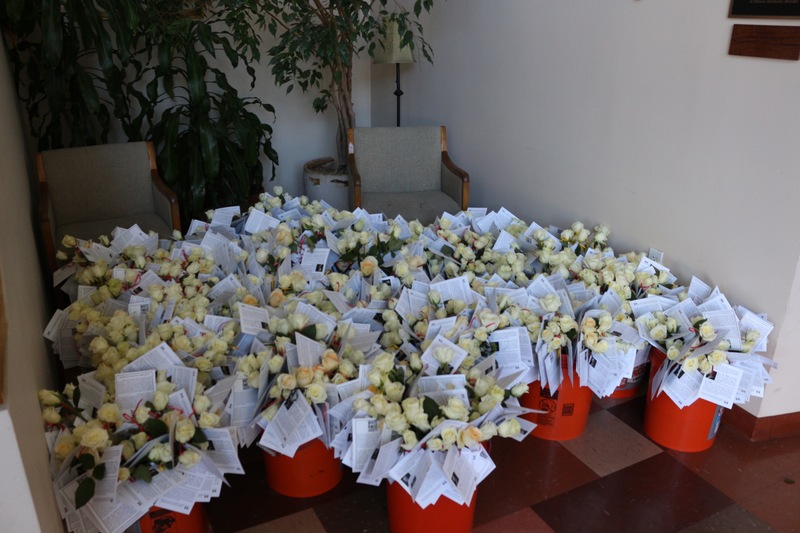 White roses ready to hand out to students. Pamphlet about Holocaust Survivor Max Glauben. Roses ready to pass out to students. Students volunteering to de-thorn the roses. 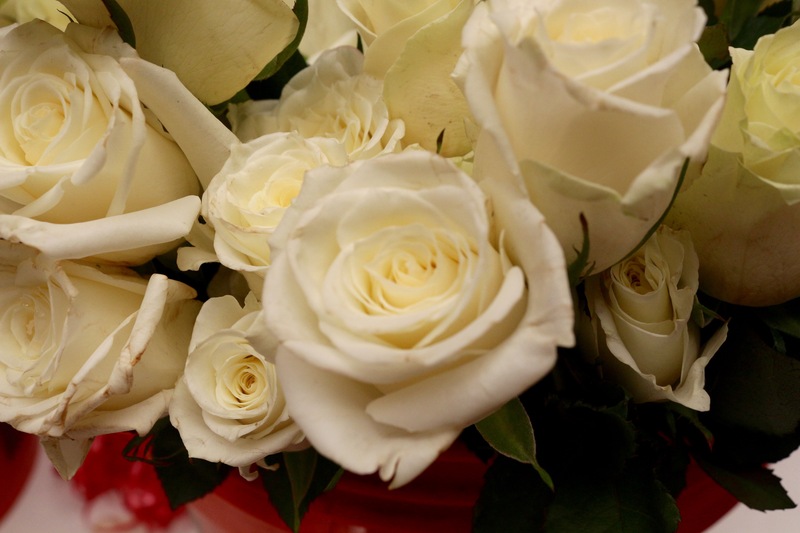 Close-up of the beautiful white roses representing the Holocaust victims. Volunteers working on the roses. Max Glauben and the White Rose Society representatives after his talk. 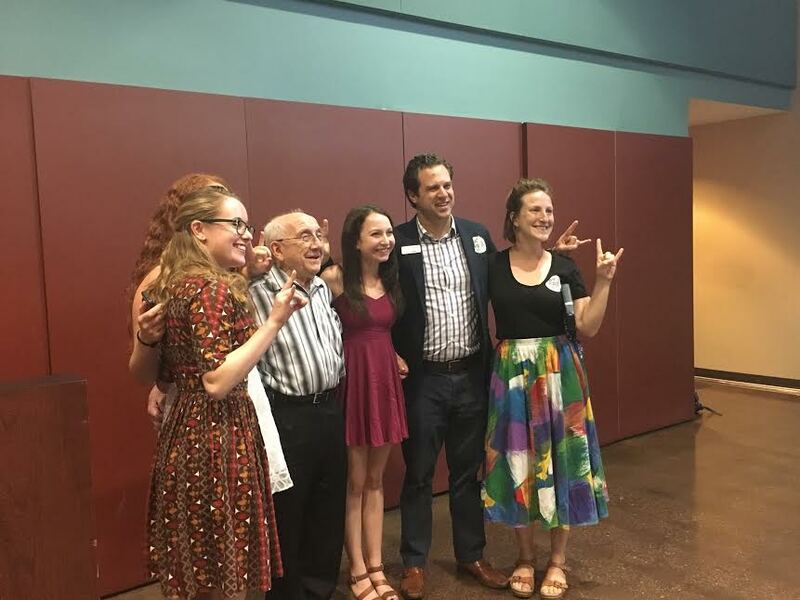 White Rose Society presented a conversation with Holocaust survivor, Max Glauben at Texas Hillel on Wednesday, April 6 as a closing to the 10,000 Roses event. Humanities Honors senior, Elan Kogutt, says he has a personal connection with Glauben. Both his grandfather and Glauben shared Flossenberg, a concentration camp that Glauben spent time in, and which Kogutt’s grandfather’s division, the 97th Infantry Division of the US Army, liberated in WWII. 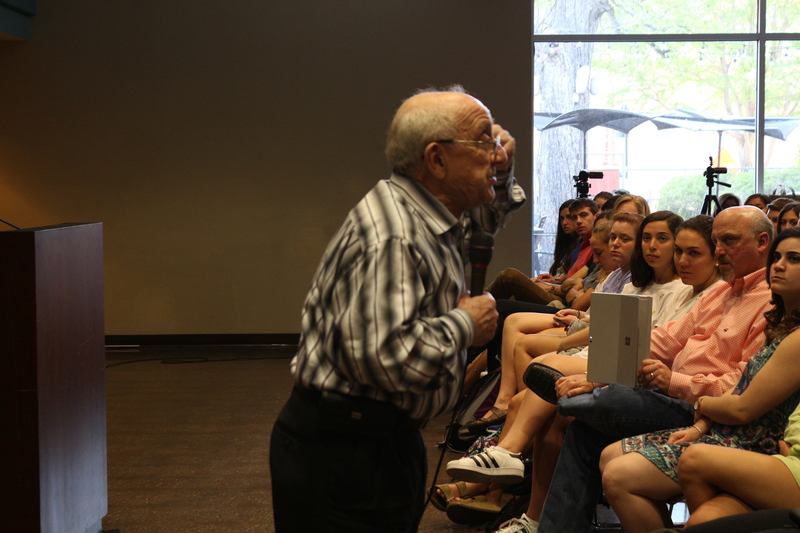 Later in life, Glauben began leading trips to Eastern Europe to teach Jewish youth about the Holocaust and share his experiences growing up in the Warsaw Ghetto and at five different concentration camps, including Auschwitz and Flassenberg. At 86 years old, Max Glauben is an upbeat, positive man who is described as someone who “laughs a lot” and “always sees the glass half full.” Glauben lived through six concentration camps during WWII, and on his arm is the constant reminder of a lost childhood and family – a tattoo of the letters “KL” (konzentrationslager), the German government’s identifying mark for the Jews who were imprisoned. During his speech, Glauben said that he believed God spared his life for a reason: to tell his story. As one of the few remaining Holocaust survivors, he feels that sharing his story is a duty he owes to the millions who didn’t survive Hitler’s commitment to murder all the Jews.